For years, journalists were never sure what to make of Porsches. It began in 1948, when the little Gmünd coupe puzzled everyone; sports cars were supposed to look like the new Jaguar XK 120. But within a year or two the hills were alive with the sound of Swiss enthusiasts blasting up in semi-competition 356s. Motoring correspondent Denis Jenkinson was an early Porsche convert and drove his 356A to race meetings all over Europe as did fellow journalist Paul Frère. The Porsche was cool, but in 1961, it was upstaged by Jaguar’s E type and Jenkinson switched his allegiance to the svelte XKE, seduced by its looks and power. The 356’s successor was the 911 which the press reviewed respectfully, but again rather cautiously. The engine was still outside the wheelbase and motoring correspondents generally followed Jenkinson’s view that Porsches were exceptionally engineered and made the best of a principle that was fundamentally wrong. After a slow start, though, the 911 began to establish itself with rally wins including the Monte. 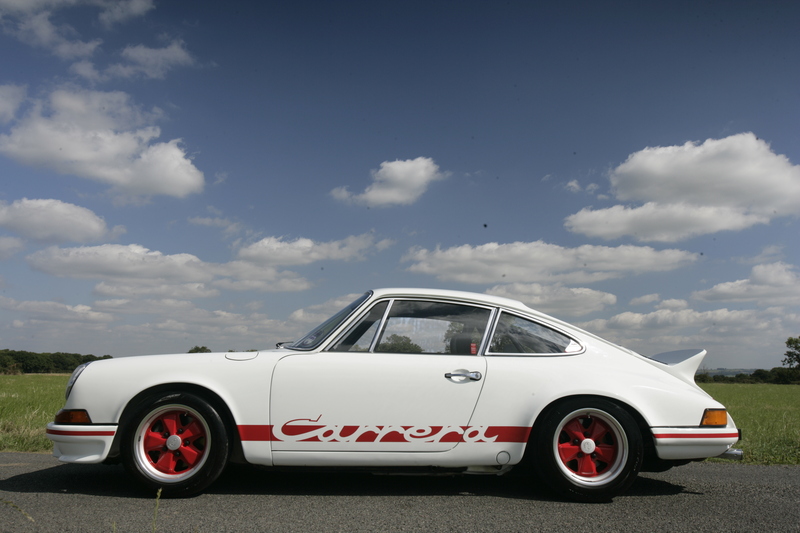 And then Porsche presented the Carrera 2.7 RS. Suddenly the 911’s distinctive architecture made sense for here was a Porsche with the perfect combination of power, lightness and agility and the scribes raved about it. In 1975 came the Turbo – a landmark which stunned the motoring press and endowed Porsche with a popular notoriety which it has never lost. Writer Doug Nye recalls how in 1980 he and Jenkinson went out early one morning in a 3.3 Turbo. So astounded were they at the incredible acceleration on boost that afterwards they both climbed out of the 911 like naughty schoolboys, convulsed with laughter. But the Turbo was not much use on Britain’s crowded and restricted (even then) roads opined ‘Jenks’, and he was not alone in thinking it was absurdly expensive; a car for the rich, not for true enthusiasts. In 1978, Peter Robinson of the Autocar proclaimed that the 911 was obsolete and should be put out to grass and Porsche’s lack of development of its oldest model seemed to stand still in the following decade, lending support to this view. It was left to Porsche stalwarts like Brian Laban of Performance Car to defend the 911 by rounding on the received opinion that it was only ‘a triumph of development over design’ if you didn’t know how to drive it properly. The 911 was really a triumph, full stop. Two more models of 911 have emerged since and new generations of journalists raised on hot hatches and trackdays are among today’s opinion formers. And Porsche has established a new benchmark, the GT3. Purists still complain about its weight, but motoring scribes marvel at how each successive GT3 somehow manages to improve on its predecessor. The wheel seems to have turned in the case of the best known of the pundits. In a recent column Mr Clarkson admitted after sampling the latest GT3 RS that he could no longer find anything to criticise about it. He had finally got used to the looks of the car of which he once said “you could spot the mistakes at 40 yards” and he loved the steering. In fact, he thought he had at last fallen in love with a 911. Whether you believe this is a Damascene conversion or that Mr Clarkson has simply decided that mocking the iconic Porsche has finally run out of mileage is up to you, but it says volumes about the 911. The outsider with its perverse insistence on having its engine in the wrong place is now the benchmark against which other aspirants to the sports car crown are judged. The 911 is a triumph indeed.